I really loved my Neon Spats n' Spangles mani, so I thought I'd do another version of it last night using my Sally Hansen X-treme Wear greens. I like this striped tips mani better on my square nails, but it still looks pretty. The first one is my left hand and the second shot is my right. For the first time I actually had equal success with both hands. I think I am beginning to feel more comfortable with the striper brushes. 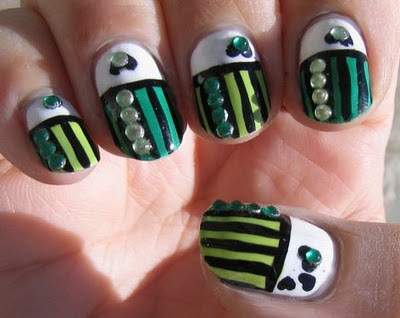 I used Wet n' wild French White Creme for the base, then painted 3/4 of the nail with alternating Sally Hansen greens. The dark one is called "Going Green" and the lighter one is called "Green with Envy". Pinstripes and -I'm going to call it the smile line but plse correct me if I'm mis-using it- were accomplished using Art Deco black striper polish. I used a bundle monster stamp for the hearts using Konad special polish in Black Pearl. Again with the blurry! I'm convinced I'm missing something with this little camera. I like this even better than the neon spats and spangles, to be honest. But then, that's probably not that surprising, coming from me. Love the colours in this one very cool! Thanks guys! I've really been digging the greens lately. I sooo have my heart set on a bottle of Nina Ultra Pro SALSA. YUM.